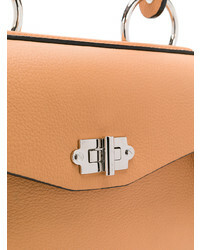 Consider wearing a beige sleeveless coat and a Proenza Schouler Small Hava Tote from farfetch.com for a relaxed twist on casual fashion. Add a pair of beige leather pumps to the mix to immediately amp up the glam factor of your outfit. This laid-back combo of a pink knit open cardigan and a Proenza Schouler tan leather satchel bag is a real lifesaver when you need to look stylish in a flash. If you want to effortlesslly perk up this ensemble with a pair of shoes, why not complement this look with tan suede over the knee boots? 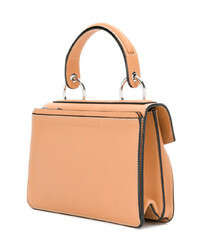 This pairing of a beige open cardigan and a Proenza Schouler tan leather satchel bag delivers comfort and fashion. Introduce brown leather thong sandals to the mix and the whole ensemble will come together wonderfully. A red coat and a tan leather satchel bag are a favorite off-duty combination for many fashion-savvy girls. If you wish to easily dress up your ensemble with one item, why not introduce black leather lace-up ankle boots to your outfit? A beige coat and a Proenza Schouler Small Hava Tote are an easy way to introduce effortless cool into your daily casual rotation. If you wish to instantly polish up your ensemble with a pair of shoes, why not introduce a pair of white leather ankle boots to the equation? 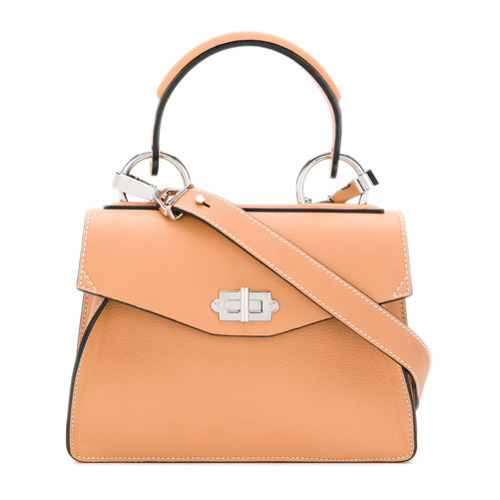 The mix-and-match capabilities of a white fluffy crew-neck sweater and a Proenza Schouler tan leather satchel bag guarantee you'll always have them on heavy rotation. If you need to immediately polish off your outfit with shoes, introduce a pair of white leather pumps to the mix. For a cool and casual ensemble, consider pairing a blue leather biker jacket with a Proenza Schouler Small Hava Tote from farfetch.com — these two pieces play wonderfully together. 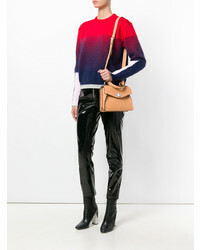 If you’re a jeans-and-a-tee kind of dresser, you'll like this simple pairing of a camel coat and a Proenza Schouler Small Hava Tote from farfetch.com. Our favorite of an endless number of ways to finish off this outfit is with a pair of white low top sneakers. A camel coat and a Proenza Schouler Small Hava Tote are great items to have in your current styling lineup. A cool pair of white low top sneakers ties this getup together.